The animals use a cocktail of decomposing skin and food to lure prey. 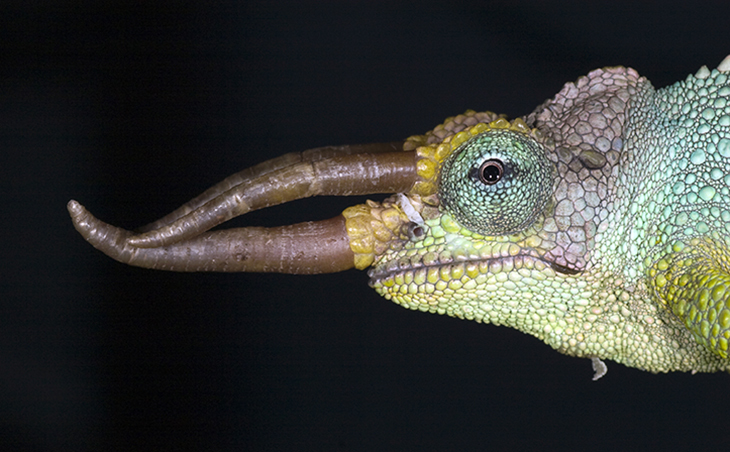 (Inside Science) -- When it comes to nabbing insects, a chameleon's nimble tongue is the envy of the forest. But even that sticky organ can only reach so far. Now, scientists are exploring how the animals may use rotting bits of skin and food to lure unsuspecting insects within striking distance. The stench of that decomposing cocktail stirred the curiosity -- and indignation -- of Marion Preest and her colleagues, who first noticed the odor among several Jackson's chameleons they'd agreed to house after the U.S. Fish and Wildlife Service confiscated the animals from a shipment at Los Angeles International Airport in 2009. "We'd go into the room, and we'd smell rotten meat," said Preest, an ecologist at the Claremont Colleges in California, who studies animal physiology. "I thought, 'I take better care of my chameleons than this. What's this awful smell?'" On her quest for an answer, a colleague guided her towards an obscure source: an unpublished Ph.D. thesis from 50 years ago written by Philip W. Ogilvie at the University of Oklahoma. In the 1960s, Ogilvie observed chameleons wiping their jaws against tree branches, smearing a foul-smelling, waxy material on the bark. And he spotted a small pouch near the corners of the chameleon's mouth where the material seemed to come from. Based on his experiments, Ogilvie suggested that the pouch contained the remains of sloughed off skin cells and rotting bits of food and that chameleons might be using the putrid substance to lure prey closer. "If you think about it, it makes sense to be able to do that," said Preest. "Chameleons spend a lot of time in trees, and their amazing tongue, which can shoot out a distance of about two body lengths, is really helpful. But if you can also do something to bring the prey to you, then that's going to increase your feeding success." In his work, Ogilvie called for a "detailed chemical analysis" of the material to shed more light on it. But no one in the intervening years had done so. "[The substance] gets noted a lot briefly, and people say more work needs to be done here," said Christopher V. Anderson, a researcher at Brown University who has studied chameleons and wasn't involved in the study. "It's amazing that nothing had been done since the '60s." Meanwhile, other scientists had raised questions about the material's origin, suggesting that it might be secretions from glands rather than decaying matter. Intrigued, Preest and her colleagues -- undeterred by the odor -- decided to pick up where Ogilvie left off. After studying the pouch's tissue, the researchers found no evidence of a gland, but did find layers of sloughed off skin cells, collecting and aging in the pouch, they wrote in a paper published in Physiological and Biochemical Zoology this month. They didn't investigate the role of food particles but given their observations of how parts of the pouch open and close as the chameleon eats, it's likely that crumbs of prey also get trapped, said Preest. Then, in experiments with houseflies, they showed that the insects were strongly attracted to the pouch contents -- almost twice as many flies moved toward the material than away. In control trials, the flies buzzed around haphazardly. Following Ogilvie's suggestion, the researchers also used a technique known as gas chromatography-mass spectrometry to identify four of the mixture's chemical compounds. Surprisingly, they found that those compounds are similar to ones in insect pheromones, which bugs use to attract mates, for example. "It looks like the lizards have somehow capitalized on this form of communication between the insects, and they're turning the tables on the insects and luring them to their deaths," said Preest. The idea that "chameleons are using chemicals that mimic pheromones to attract prey items is a really cool finding," said Anderson. "It shows how complex the feeding strategies for these animals really are." Still, that may not be the whole story. "We don’t know if it's actually those compounds that are attracting the flies, or if it's just that the material is really smelly and disgusting," said Anthony Herrel, a biologist and research director at the French National Centre for Scientific Research who wasn't involved in the study. We know flies are attracted to decomposing bodies because they can lay their eggs there, he said. "So the link between the actual compounds and the pheromones is something we can't make a very strong case for yet. But what they showed is very suggestive and interesting, and it should be followed up on." Preest and her colleagues did try to locate Ogilvie, she said. "But he passed away in , so we weren't able to give him a copy of this work. That would have been fun."